What is a Hidden Mickey and where can I find it? I’ve long had a fascination with Hidden Mickeys. I learned about them in the early 1990’s, probably from a Disney Cast Member in the parks. 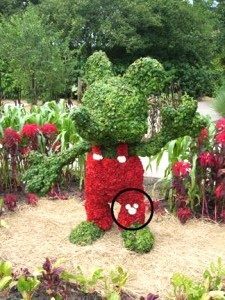 Here’s the definition of an official Hidden Mickey: a partial or complete impression of Mickey Mouse placed by the Imagineers and artists to blend into the designs of Disney attractions, hotels, restaurants, and other areas. Jim Hill believes in this "unofficial history": Hidden Mickeys were born as the Imagineers were designing Epcot in the late 1970's and early 1980's. At that time, Disney management felt that the characters (such as Mickey and Minnie) belonged in the Magic Kingdom only. The Imagineers disagreed and began slipping Mickeys into Epcot! Guests and Cast Members started spotting them and the concept took on a life of its own. I suspect that Mickey Mouse designs that were previously in place in WDW (and Disneyland) also became known as Hidden Mickeys. Because of the popularity of Hidden Mickeys, Imagineers are encouraged to place them in new construction. A Hidden Mickey can take different forms. 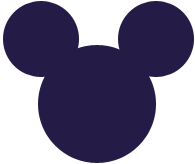 The most common image is the tri-circle Mickey frontal silhouette: three circles that form Mickey’s round head and adjoining round ears. Other images include a side or oblique (usually three-quarter) profile of Mickey’s face and head, a side profile of his entire body, a full-body frontal silhouette, a detailed picture of his face or body, or a three-dimensional Mickey. Sometimes, just his gloves, handprints, shoes or ears appear. 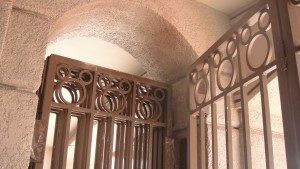 Even his name or initials in unusual places may qualify as Hidden Mickeys. And don’t forget other characters: Hidden Minnies, Donald Ducks, Goofys, etc. Keep in mind that decorative (décor) images don’t count because they’re too obvious (not Hidden). Most debate about HM’s involves the three-circle forms. My definition of a “true” three-circle (or classic) HM is rather strict: the circles must be in the right position and proportions, and Mickey’s head is larger than his ears. However, there are classic Mickeys that are not positioned or proportioned perfectly but are so accepted among Cast Members and the public that I include them as HM’s. For example, the small round tiles along the Standby entrance queue of Rock ’n’ Roller Coaster at Disney’s Hollywood Studios are all about the same size, but the image is accepted by Cast Members and guests as a Hidden Mickey, so I include it in my book and on my website. Two of the early HM’s I recall marveling over (pointed out to me by Cast Members) are the one in the mural above the entrance to Body Wars in the Wonders of Life Pavilion at Epcot and the one in the hanging vine above the giraffes in the Africa room of the “it’s a small world ride” in the Magic Kingdom. Hidden Mickeys that don’t satisfy our criteria outlined above are classified as Questionable Hidden Mickeys. I post many of the Questionable Hidden Mickeys on my website so folks can vote to approve or disapprove the images as accepted Hidden Mickeys. If it’s accepted, I add the Hidden Mickey to my book.